If you read my blog last year, you know that I attended a series of events (here and here) created by Glory Edozien, who runs the Inspired by Glory brand. The brand also produces a regular vlog series, The Inspire Series, which is aimed at encouraging women to live, love, pray and be inspired! 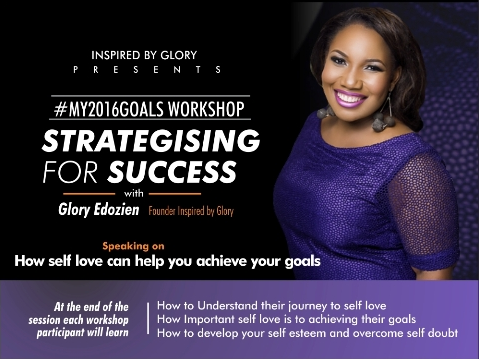 Glory is back with a new event aimed at personal development, goal setting AND actualization for women. I'm proud to be a media partner for the event and I think it's a great opportunity for any woman who's looking to progress in 2016. And now I introduce #My2016Goals - Strategizing for Success! Every year we make resolutions, set goals, targets and hope we achieve our dreams. For most of us, by March some of these goals are either forgotten or seem beyond our reach. The truth is, sometimes, life gets in the way. Old habits return, we get weighed down by over ambitious goals, lack proper planning and time management skills, lack self confidence and motivation or simply give up too easily. To make matters worse, almost every news pundit is suggesting that 2016 will be a tough year for the economy. How can we position our personal lives, careers, businesses to succeed in tough economic times? How can we set realistic but ambitious goals for 2016? What strategies for success can we imbibe? How can we empower ourselves financially to meet our goals? How can we ensure we stay focused on achieving our goals throughout 2016? The objective of the #My2016Goals Workshop is to ensure attendees set realistic, targeted and ambitious goals, while also ensuring that they have the tools to remain focused on actualisation throughout 2016. At the end of the event each woman will have a set of realistic goals, a personal vision board, tools for tracking and monitoring progress, an understanding of the role of finance in realising her goals, and much more! 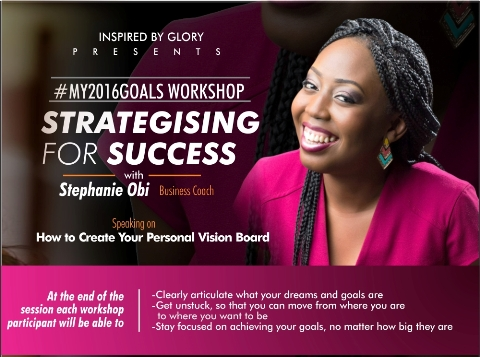 Stephanie Obi - Business Coach who will be helping workshop participants to create their personal vision boards and teaching on how to stay focused on achieving your goals no matter how ambitious they seem. 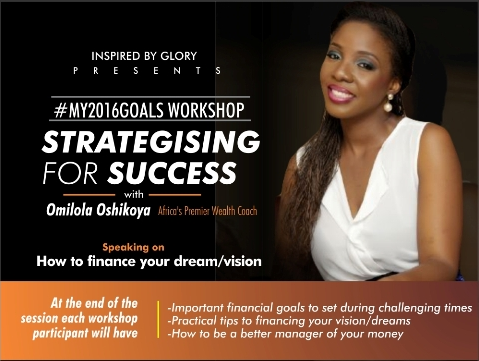 Who is the #My2016Goals Workshop for? 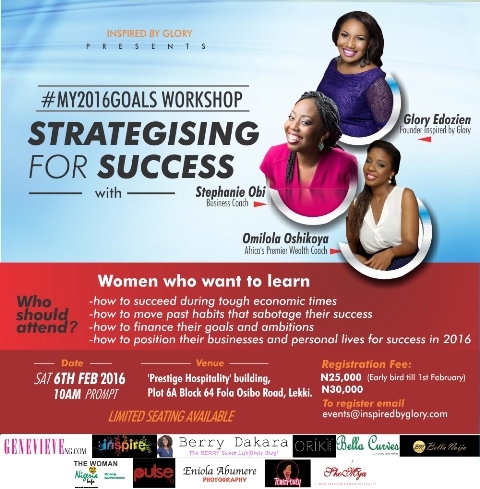 The #My2016Goals Workshop is for women who are passionate about personal development and want to succeed in 2016. It is for women who want to learn how to stay focused on achieving their goals no matter how big they are, women who want to learn important financial goals to set during tough economic times and how to finance their dreams. The event is also for women who want to learn how to move past self doubt and become better managers of their money. To register: please visit here and fill out the form at the bottom of the page. Good to see that you are a media partner, sounds like a very beneficial event. I really like Glory and what she's been doing. No way I wouldn't partner with her. Feels inspiring already. Hope I'll be able to go sha. How's the week looking, berry? Week's been so-so, truthfully but I'll be fine. I'm definitely going for the event. It's time to start investing in ME and developing myself. Gosh can't wait to be back in town...this is my year of personal self development and it's events like these I'd love to attend! Girl! There might be other things you can watch online - a lot of coaches online these days. I was already excited about this series. I attended the last one, but ermm to be honest, 25k dikwa plenty o.
Wow, I would have loved to go but baby girl(i) is too rich right now. p.s: i always enjoy inspired by glory's events. Her events ARE always very good, I agree. It'll be a good event. I'm sure of it.